2012’s Roman Roads IV – XI by Land Observations (aka James Brooks) was among this reviewer’s favourite albums of that year. Having spent a pleasant hour or so wandering round James Brooks’s exhibition The Information Exchange at the Domo Baal gallery in London that same year, Brooks’s compositional approach, like his approach to his artworks, was much clearer to me than if I’d just listened to the album; the works on display at his show were intricately layered, imaginatively conceptual and yet somehow deceptively simple, precisely the same as the music offered up for scrutiny on Roman Roads IV – XI. Later still, at an intimate show at London’s Rough Trade East, I was able to see the artist at work as he faithfully reproduced the album’s layers and textures live on the venue’s tiny stage using only a guitar and a bank of pedals. To suggest he was focused would be an understatement. For this follow up, Brooks once again returns to the layered networks of melody, rhythm and rich textures of the first album, only this time the conceptual departure point is rather more, well, grand. At EPCOT’s Spaceship Earth attraction, the narrative from Dame Judi Dench describes the original, pioneering roads built across their empire by the Romans as ‘the first information superhighway’, a web of interconnecting routes that revolutionised the transportation of troops, cargo and messages. Just as with today’s internet, it wasn’t long before the application of those roads became something that allowed for altogether more leisurely pursuits – namely travel for recreational purposes, usually by the wealthier citizens who could afford to do so. 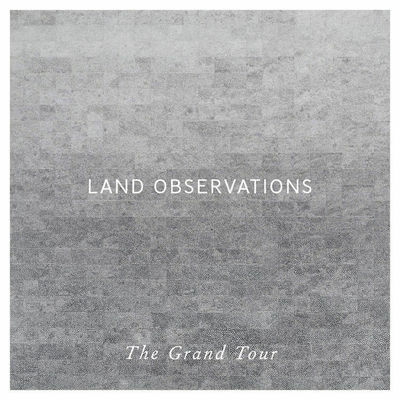 Brooks’s second Land Observations album takes its inspiration from the Grand Tour, which saw rich 18th Century university graduates schlepping off to Africa and Europe to experience Old World culture and broaden their horizons. (Quite how this changed from being a wealthy pursuit to the pre-university ‘gap year’ beloved of impoverished students heading out to Thailand with nothing but a few baht, a rucksack and a supply of Rizlas is beyond me.) Thus The Grand Tour, taking in everything from the streets of Vienna and the mountains of Switzerland, is a generally more austere album than its predecessor, less urgent perhaps, more languid, evoking the lazy, unhurried passage of the environment from a carriage window rather than the firm, resolute industrious progress suggested by Roman Roads. Though his raw materials are of the stringed variety, there is something distinctly ‘electronic’ about James Brooks’s music, a Kraftwerkian simplicity and starkness perhaps. On the faster tracks, the ghost of Neu! and sundry other German bands can be heard in his long-form, repetitious guitar melodies, while the textures evoke the ideas of Robert Fripp only with more structure and less inherent Progishness. The opening bars of ‘The Brenner Pass’ even have an almost bluesy, early rock ‘n’ roll dimension, and for a brief moment you expect a jazzy beat to creep in; but Brooks is far too clever for that. Through the continual layering, these tracks are adept at giving the impression of height and depth, as well as the wide-screen expanse of open landscapes. That’s a significant sleight of hand on the part of Brooks, and one that would be easy to overlook. In context, Brooks calling himself Land Observations for what is hopefully becoming a series of such albums, is utterly appropriate, all told. This entry was posted in Album reviews and tagged Appliance, James Brooks, Land Observations, Mute Records, The Grand Tour by 429harrowroad. Bookmark the permalink.